Novel Effort – Que Sera Sera?? The novel writing effort is not going so well. I’ve begun to think that maybe I’m not a novel writer at all. More’s the pity that I’m beginning to think that I don’t really mind all that much! What’s happening to me? I started out with a character that’s lived in my head for many years, one that I’ve never been able to tack a story to. I thought maybe if I had a severe deadline (30 days of November in NaNoWriMo) and let myself write, write, write to pile up words according to specifics (50,000 words or approximately 1670 words per day), and didn’t allow myself time to read and rewrite and edit myself, that it could happen. On October 31, I began to write because, on the beginning date (Nov. 1), I knew I would be busy from sunup to sundown, that I would just substitute the last day of October as my first day of November. I logged in 1436 words that day. On day 2, I tried to log an additional 780 words, as pathetic as they were, but the NaNoWriMo.org site was so busy, I waited and waited and waited, and finally gave up without posting an update. That takes me through Friday. Saturday I spent cleaning, plus folding laundry done in increments several days before (it had been piled up–neatly of course–on top of the dining table all that time). Then we met a group of friends for an early dinner in a downtown restaurant, then on to a lecture by Jeannette Walls (author of The Glass Castle) at the nearby library, and arrived back home around 9:30 that evening. Sunday, Hubby decided he would really like to have the furniture and television in our large family room re-arranged so that we could see the fireplace as we enjoyed its warmth, and watch t.v. at the same time. It was a good idea because the room has high ceilings and windows and French doors almost floor to ceiling and sun shining through those windows at certain times of the day did not make for good viewing; neither of us like pulling the shades down in the daytime to keep the glare out of the t.v. screen. So, like the three little pigs, we huffed and puffed and finally got everything in place less than an hour before we were due at our daughter’s for babysitting duty. Today, Monday, I started off the day–after coffee and breakfast of course–at the computer. The words just would not come. Since I have already written one book, I think it’s safe to say that, for me to write anything of any length and/or depth, I would need to isolate myself in a cabin in the deep woods somewhere, with a freezer full of t.v. dinners or a food delivery service or a live-in cook/maid, in order to produce a book period! 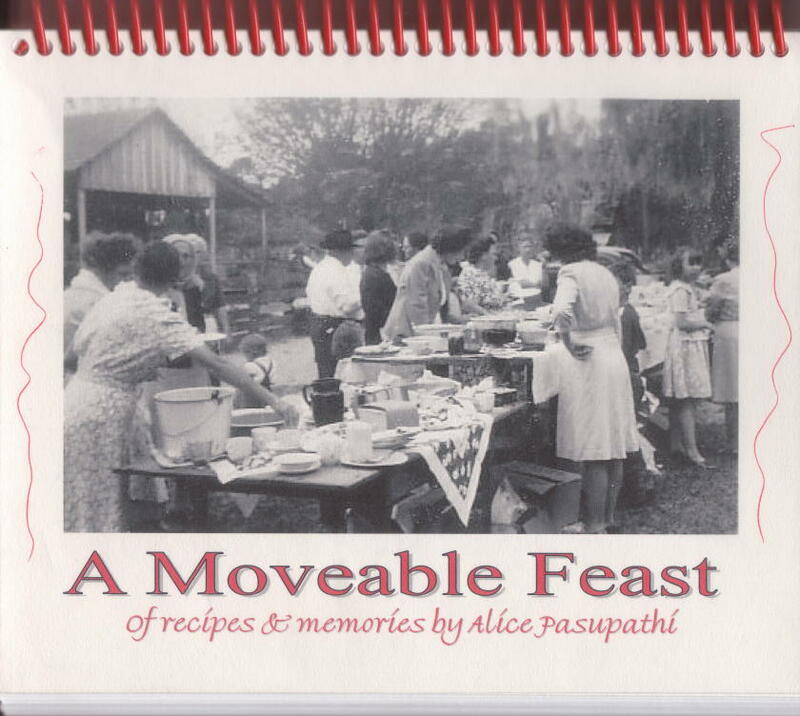 I remember the 2 or 3 years it took me to write my cookbook, A MOVEABLE FEAST (a collection of family memories and recipes). I devoted parts of almost every day to it, sometimes 10-12 hours, sometimes only a few, but it took most of my brain, or thought processes, residing in a different place than the present in order to finish. Hubby was out of town fairly often in those days, and t.v. dinners did work out pretty well when he was away. Other times he’d come home to find me typing away and staring at the wall with a faraway look in my eyes. If dinner wasn’t started, he’d pitch in and either cook or help me whip something up fast, but it was so hard for me to focus on there and then, since I might have been residing in 1948 or 1954 or 1963 all day long (due to the nature of the book) rather than whatever the year was. As is customary, after the Jeannette Walls lecture Saturday night, I came home and began to surf online to find the book, and finally put a reserve on a copy from the library which I hope to be able to read by Christmas. In the meantime, while I was in the surfing books mood, I found another one that looked very very interesting–WATER FOR ELEPHANTS by Sara Gruen, and published by my favorite Algonquin Press. Then I put a reserve on a copy at the library so that it can be added to my “read next” list. Do you see a pattern emerging here? I certainly do! I remember telling a friend in Ohio years ago when we met in the stacks at the local library there in Grove City “. . . so many books, and so few more years to read them all!” She, being as voracious a reader as I, heartily agreed, and we both went on to find another book, or two or three, to read. That’s the problem I think for me: if I have to choose between reading or writing a book, reading wins heads down; trying to write leaves little time for reading. That isn’t to say, however, that I wouldn’t like to keep plugging along on the project started to see where it leads me, but it does say that the outcome–at the end of November–isn’t important. I think I know now that it really isn’t important to me to write a novel, and maybe it never was. Ranting and remembering and talking to myself in blogs is just enough at this point in my life and I feel quite comfortable knowing that. This entry was posted in Paradigm Shift, Personal, Writing by Alice. Bookmark the permalink. I hope you don’t give up on the novel. I know it’s hard to find time – my big curse – too much to do! But I am determined to write a novel… and I hope you stay determined to do the same! Good luck to you! And congrats on publishing the cook book! I was really happy to see that you’re not beating yourself over the head for not keeping up to the required words for this novel. As I’d told you, “I” could NOT do something like this. I’ve written 3 published novels, one manuscript and I’m working on a second manuscript. The novels each took about nine months to do the first draft. I didn’t write every single day. But on the days I did, I put in a good 8 hours, with breaks in-between. Just like a real job. My current manuscript….I think I started it mid or late August. Can’t quite remember. I have 150 pg. finished. Haven’t touched it since returning from Paris. Will I finish it? ABSOLUTELY! After I return from the conference I’m attending this week, next week my time will be devoted to doing just that. But on MY time. Even a publisher gives an author approximately a year to finish a work in progress. No way could I do this 30 day thing. If you finish it, I applaude you. And if you don’t……I say you’re human. But wishing you the best, no matter what you decide, Alice. You’re right, Alice, about doing what fits most. It is a very unusual exercise in writing and I’m not quite sure how it is going for me but I’m hoping to plow through until the end. I’m sure you will finish your novel … and it will be in a much better first write than my story will be, I guarantee. It is moving along way too fast for me to think it out clearly and make the sentences flow seamlessly like it will have to do to really pass the muster of being a novel. I will have a lot of work to do come January. I find it amusing that you were eating tv dinners while writing a cookbook. You can be a very good writeer without being a very good novelist. Perhaps you’re having a problem writing a novel because fiction isn’t your genre. There are many very interesting reads that are not fiction.